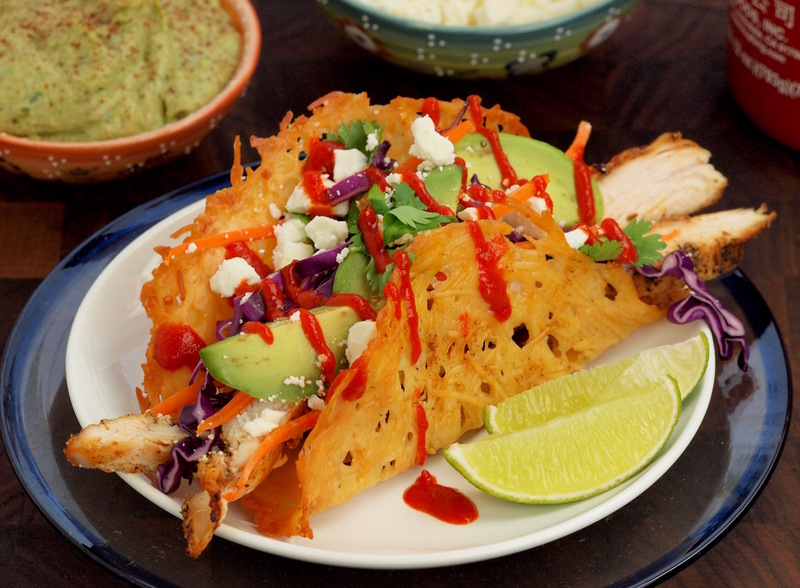 These Chicken Tacos served in Parmesan Shells satisfy your cheesy Mexican cravings! Make Parmesan Taco Shells: Preheat oven to 325° F. Line 2 large baking sheet trays with parchment paper and lightly spray with cooking oil. Spoon two tablespoon of Frigo® Shredded Parmesan Cheese into a small mound on the parchment lined baking sheet tray, then top with two tablespoons of Frigo® Shaved Parmesan Cheese. Finish with a pinch of taco seasoning, and then gently pat down each mound so it is flattened slightly. Bake until golden brown, about 8 – 10 minutes. Working quickly with a spatula, drape the cheese over the handle of a thick wooden spoon or an inverted cooling rack placed over two overturned cups and form into a shell shape. It will harden within 2 minutes. Transfer to a plate to cool completely. Repeat with remaining cheese to make more shells. After cooling completely, these shells can be stored in an air-tight container at room temperature for up to 2 days. Make Chicken Tacos: Season the chicken with 1 tablespoon vegetable oil, taco seasoning, ground cumin, Adobo seasoning, black pepper, and ground cinnamon. In an oven-safe skillet, add 2 tablespoons vegetable oil over medium-high heat. Once hot, add the seasoned chicken. Reduce heat to medium and cook 4 – 6 minutes on each side or until golden brown and done. Remove from heat and allow to rest. While chicken rests gently toss red cabbage, carrot, sliced red onion, ½ cup fresh cilantro, sliced avocado, lime and Frigo® Crumbled Feta Cheese together in a bowl. Season with salt and black pepper to taste. Set to side. Make Avocado Cream Sauce: Combine two avocados, Frigo® Whole Milk Ricotta, ¼ cup chopped red onion, ¼ cup fresh cilantro leaves, juice of 1 lime, mayonnaise, pickled jalapeños, 1 teaspoon sea salt, garlic powder, and ground cumin in a food processor. Process until smooth. Taste and adjust seasoning. Transfer the sauce to a serving bowl and set aside. To assemble the tacos, place the chicken in a Parmesan taco shell and top with chicken, vegetables, and avocado cream sauce. Enjoy!